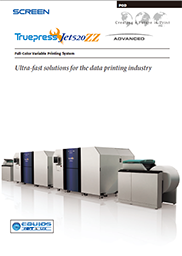 Truepress Jet520ZZ Advanced | SCREEN Graphic Solutions Co., Ltd. Speed previously given as 721.7 feetThe Truepress Jet520ZZ Advanced provides high-speed output of up to 220 meters (721.7 feet) per minute. That means you can get jobs done quickly and offer superior service to customers who require fast turnarounds. The system's EQUIOS drive module helps minimize lead time, allowing you to start printing faster and giving you better operating ratios. Piezo DOD head The Truepress Jet520ZZ Advanced features Piezo Drop on Demand (DOD) inkjet heads manufactured by Seiko Epson Corporation, which are well known for their reliability. The piezo elements in these inkjet heads change shape according to the voltage applied, enabling extremely fine control of the ink drops ejected from the head. This grayscale technology generates extremely smooth tones. Advanced workflow solution platform EQUIOS is a universal workflow system that draws on SCREEN’s extensive prepress and printing knowledge to maximize the performance of our cutting-edge inkjet technology. EQUIOS offers high-speed processing using Adobe’s PDF Print Engine 4, a newly developed color management system that links to paper information and an open interface that facilitates automation. These technologies create a highly user-friendly GUI that integrates SCREEN’s full prepress knowhow. These features have been developed based on SCREEN’s wealth of experience and encompass the full range of our professional knowledge. Together they help to provide an outstanding work environment regardless of the operator’s own skill level.